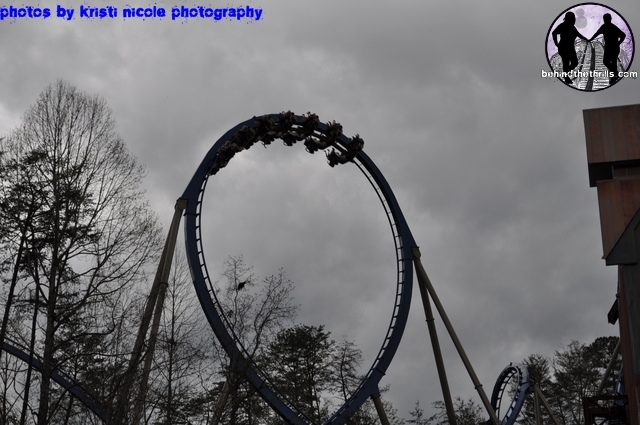 Friday the all new coaster at Dollywood, Wild Eagle, opened to the public. 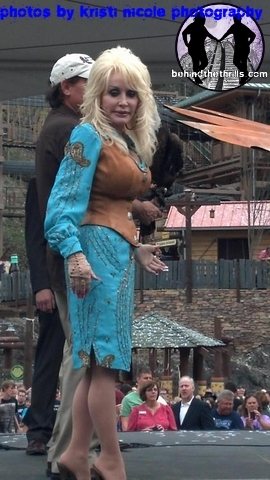 Park owner Dolly Parton was on hand to not only open the new coaster, but to personally greet the first riders, and perform her song that was written and recorded specifically for Wild Eagle. 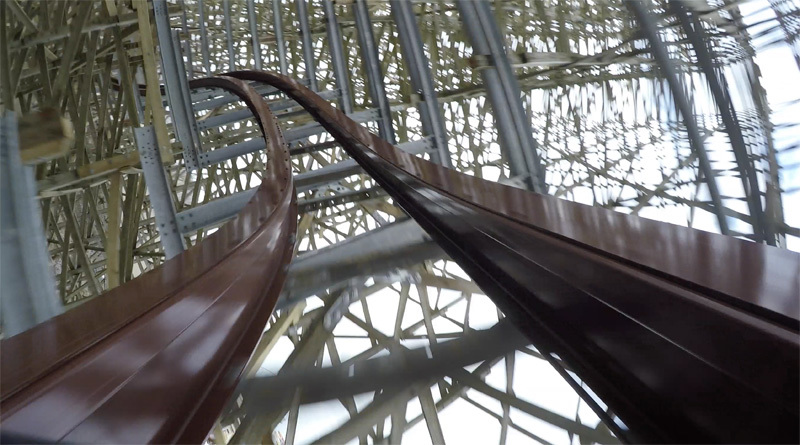 As the clouds gathered, it couldn’t stop spirits and riders from soaring into the air, and around the trees as the all new coaster made it’s first of many trips around the track. 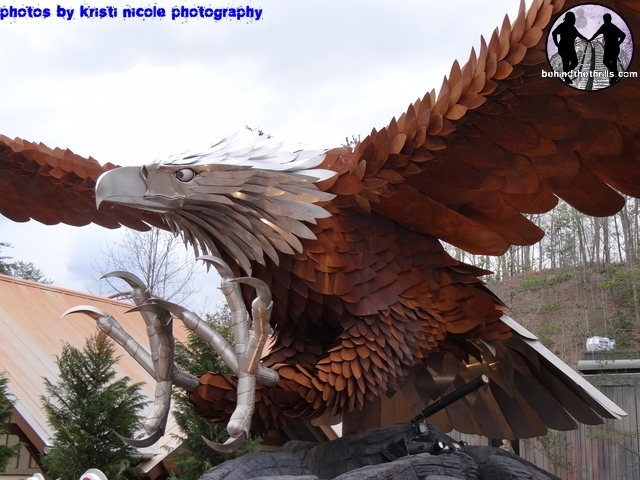 Outside of the station, a huge metal eagle greets would be riders. The eagle is hand crafted, and stands as a symbol for those ready to fly! 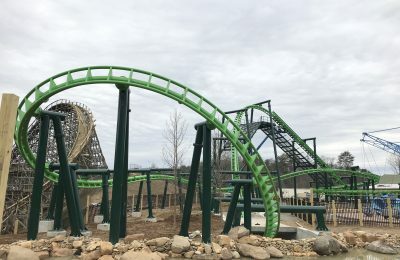 THe coaster is an all new B&M Wing Rider, and the first wing rider in the country. Traditional coasters put you either in a car, above or below a track or suspended from a track. Wing Riders have you sit beside the track on wings that come off of a center train. You have nothing above or below you, leaving you hanging free in the wind. Dolly Parton herself was on hand to personally welcome the first train of riders who bid for the chance online. Top speed on Wild Eagle is 61 MPH as it dives down through the 135 foot first drop and into four inversions, including a huge loop, and inclined Immelman. Dolly was also on hand to help open the first of many new shows this season with the “Festival of Nations”, a month long celebration of the cultures around the world through a dazzling array of shows. 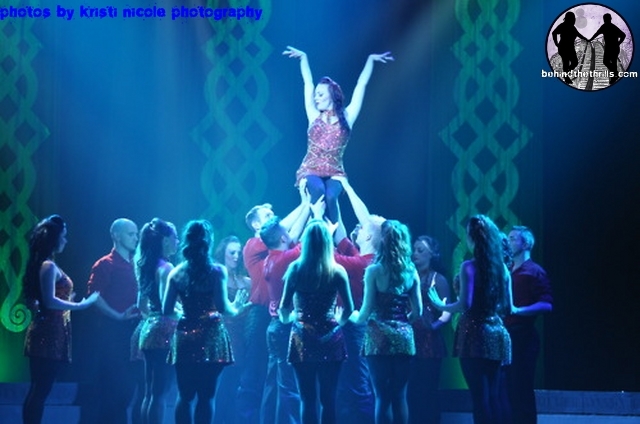 New this year is Spirit of the Dance, the acclaimed travelling show that has been seen by millions. Spirit of the Dance is just one of the many shows that can be seen throughout the day at Dollywood during the Festival of Nations, now through April 30th. Dollywood is now open for the 2012 season, and will be open until December 30th. For more information on Dollywood, including tickets, visit the official Website!